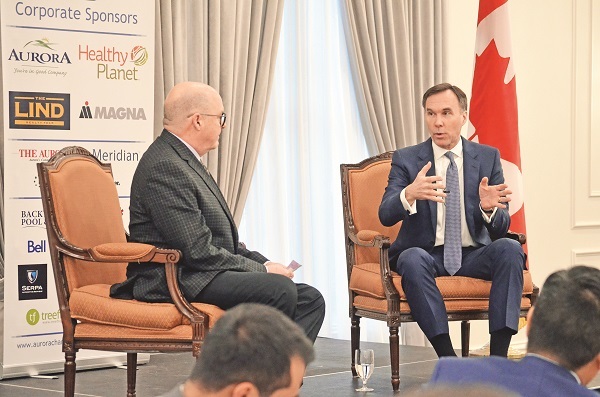 Canada will have a Federal Election this year and Finance Minister Bill Morneau stated his case for the Liberal Government at a breakfast hosted last Tuesday by the Aurora Chamber of Commerce. Interviewed before an audience by Stewart McLaren of Almac and McLaren Doors on stage at the Royal Venetian Mansion, Mr. Morneau fielded questions on a wide variety of topics, including trade and competitiveness. This translated into choosing investments over austerity and, he argued, resulted in dividends, but the last couple of years have presented some new challenges for the country, particularly when it comes to international trade with Canada’s largest trading partner, the United States. “We have seen some tumultuous things internationally with trade between the US and China causing a lot of anxiety, of course, and particularly difficult diplomatically right now,” said Mr. Morneau. “People are feeling anxious. They are looking around the world and they are recognizing that it is moving faster than it ever has. The Prime Minister had an interesting quote and he said, the economy is moving faster than it ever has before, but it is slower than it ever will be in the future. It gives a sense of how rapidly things are changing in our world. Making statements like Mr. Ford’s, he said, were “potentially destabilizing” with the potential of “causing real harm to Canadians, real harm to their jobs and their potential jobs in the future. Looking ahead, Mr. Morneau said the Liberal Government has made significant changes in reducing taxes for middle class Canadians, reducing the tax bracket for individuals making between $45,000 and $90,000 by seven per cent, retooling the Canada Child Benefit to better benefit families in greater need, and focusing on improving transit with Regional governments. Individuals attending the breakfast, however, wanted more and emcee Mr. McLaren and individuals peppered the Minister with questions, many of which had to do with trade and the cost of doing business. The new trade deal between Canada, the United States and Mexico was under the microscope, particularly when it came to lingering tariffs levied by the U.S. government on steel and aluminum. Mr. Morneau said the Government was working “on a very regular basis” to address the tariff situation. Business owners also approached him with concerns about the perceived negative impacts climate change policies might have on businesses, and possible alternatives. One such alternative proposed to the Minister was the creation of a system of credits to incentivize businesses to reduce packaging and divert materials away from landfill.